This week’s theme was really a cross between two things: food and Halloween. What happened is I planned this way back in August and somehow forgot about Halloween. I know, I know! How could that have happened?? So, I decided to scratch a few of the food books I had planned and inserted some Halloween books. It worked out all right, no one really cared or noticed. First we read On Halloween by Lark Carrier. This was a lot of fun. The kids really enjoyed it because there is a lot of opportunity for audience participation. Next we read Charlie Chick by Nick Denchfield and Ant Parker. I think this is one of my favorite books for storytime. It’s short and sweet and lots of fun. It’s a pop-up book, which is always a crowd pleaser. I have also found that it’s a great way to get everyone back on track if we get a bit rowdy. After that, we read The Very Hungry Caterpillar by Eric Carle. In our storytime collection we have the pop-up version of this classic. Reading this version gives it a whole new dimension. It’s a really well done pop-up book and just makes Carle’s illustrations even more beautiful. Finally, we finished with Eerie Feary Feeling by Joy Hulme. This was also a pop-up book. Maybe the theme was actually pop-up books this week? Ha! It was no surprise that this was also a crowd pleaser. And a great finish. 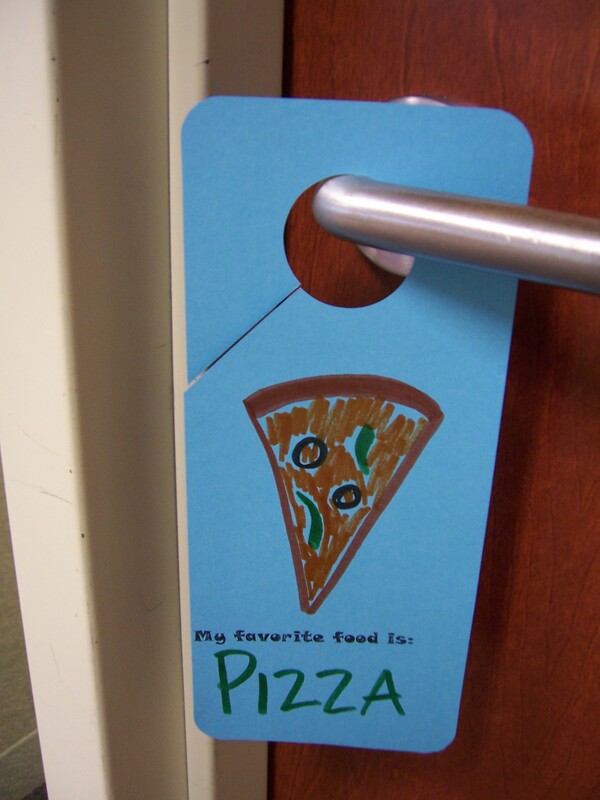 For craft, we made doorhangers and drew our favorite food. I was so impressed with the parents of my city. They must really feed their children healthy food. While everyone said that they like pizza and cookies and candy. There were lots of healthy foods such as nuts, cucumber, watermelon, apple and pasta. For mine, I chose pizza, but mostly because it’s sort of easy to draw. My REAL favorite food is cupcakes. 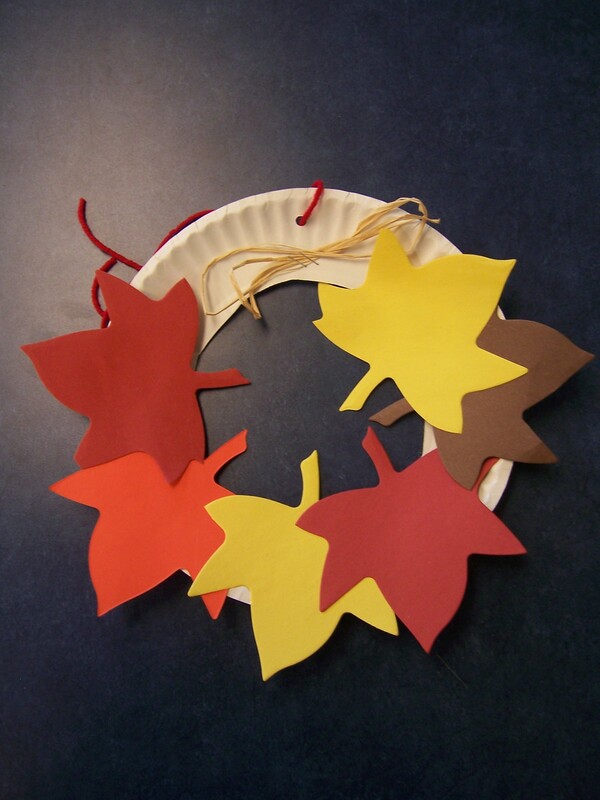 For storytime this week, we learned all about pumpkins! The first book we read was Apples and Pumpkins by Anne Rockwell, pictures by Lizzy Rockwell. This was a fun book to start with because it sort of piggy-backed off of last week’s apple theme. It’s a cute story with great illustrations and led to a nice discussion about visiting pumpkin patches. Next we read It’s Pumpkin Time! by Denise Fleming, illustrated by Shari Halpern. This book is also about a pumpkin patch. 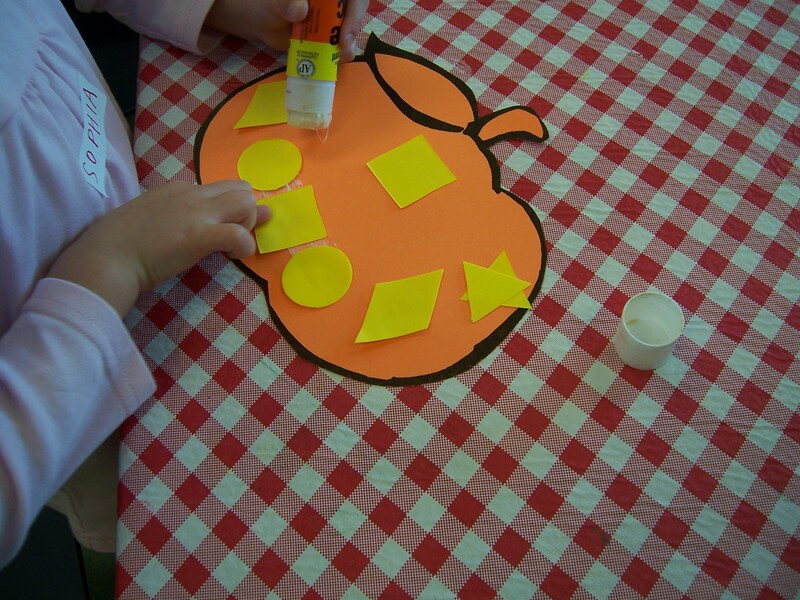 In the story, the children tend their own pumpkins in anticipation for the jack-o-lanterns they will create. I had hoped to only read books about pumpkins and not get too much into Halloween since it is a few weeks away. I found this almost impossible when choosing books because most of them did deal with Halloween in some way or another. The final book we read was Pumpkin Soup by Helen Cooper. This is a very sweet story about three friends who make pumpkin soup together. I enjoyed reading this book because it had nothing to do with Halloween and had a nice message about friendship. Additionally, I love this time of year because of all of the yummy things that can be made with pumpkin- including pumpkin soup! 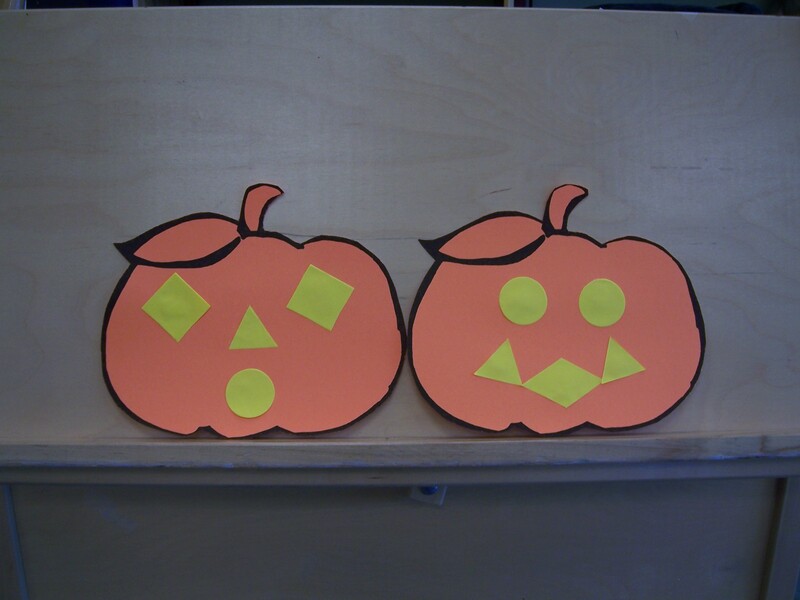 For the craft this week, we made our own jack-o-lanterns with pumpkin cut out and basic shapes. Each child was given a few of each shape and asked to create their own face. This week’s theme was a bit of a fall theme. And what says fall more so than a lovely, ripe, red apple? The craft was all about apples and we did a short fingerplay about apples as well so that’s where the theme came into play. The books, however, were more about fall. They were perfect for this week since the temperature dropped and it really feels like fall. First we read Run,Jump, Whiz, Splash by Vera Rosenberry. This book is all about the seasons. It follows two children as they run, jump whiz and splash through the year. Next we read Bear Feels Sick by Karma Wilson. Finally we finished with The Long Nosed Pig by Keith Faulkner. Ok, ok, this had nothing to do with fall. It’s just really fun. Faulkner does great pop-up books and ti was a great way to bring the group back together and pull them in for one final story. For the craft this week, we put apples on trees. 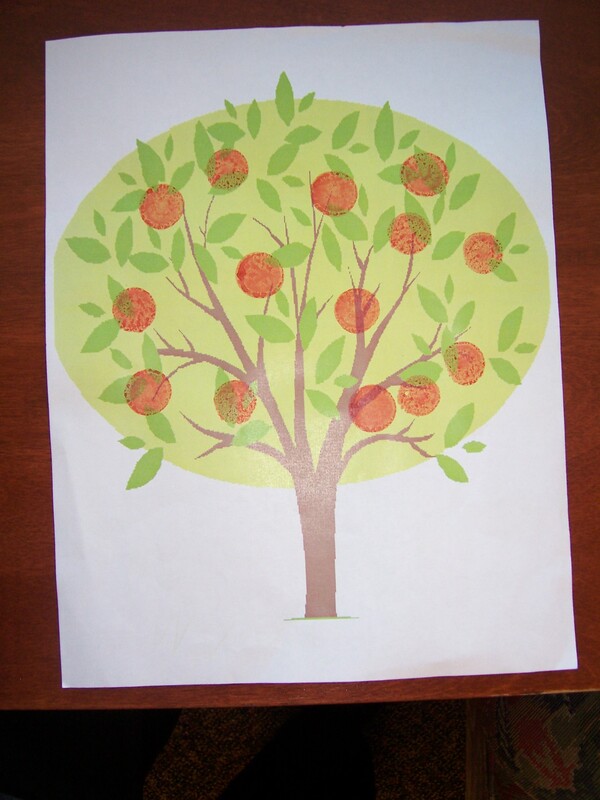 The kids put the apples on the tree with some cool sponge applicators called Do-A-Dot Art. It was lots of fun and very easy. I put out the red, green and yellow do-a-dots and let the kids go crazy. I wish I could take pictures during the program to show how creative they kids are, but we are too busy. Maybe I will be able to do it next week.